Sri U. Ve. Velukkudi Krishnan Swami started the 11th episode of Sri Ramanin Padhayil by reciting the below sloka. The above Sloka is Lord Shiva's reply to Goddess Parvathi's question as to which mantra can be easily recited and its effect equivalent to Sahasranama. Lord Shiva's reply was Rama Mantram. From Himalayas in North to Kanyakumari in South, one can hear Sri Rama Namam everywhere. Rama Namam has been uttered and is lasting in all the places travelled by Lord Rama. Listening to Rama Namam is an blissful feeling and is the one of the noblest acts one can do. We, following the footsteps of Lord Rama are in an important place today i.e. confluence (Sangam) of river Ganga and Son. Previously we had holy dip at confluence of river Ganga and Saraya and saw all the stories related to it. The Sangamam of Ganga and Son river is located near Doriganj in Saran district of Bihar. Sage Vishwamitra along with Lord Rama and Lakshmana stayed in the banks of river Son and Sage Vishwamitra narrated great stories to them. During our time of visit all the rivers were running full. Thirumangai Aazhwar is no exception. He reiterates the fact that the ganges which was in the heavens came down with the great efforts of Bageerathan and stresses the importance of Gangai in each and every pasuram of his thriumozhi. The Ganges River is the greatest waterway in India, it is one of the longest rivers in the world. Sage Vishwamitra narrates the story of birth of river Ganga from this place i.e. on the banks of river son. The river begins high in the Himalayas as a pair of head streams. It begins in an ice cave in the mountains about 10,300 feet above sea level. The river flows across the northern corner of India. The Ganges flows across India and Bangladesh until it empties out into the Bay of Bengal. Why is she known as Ganga? 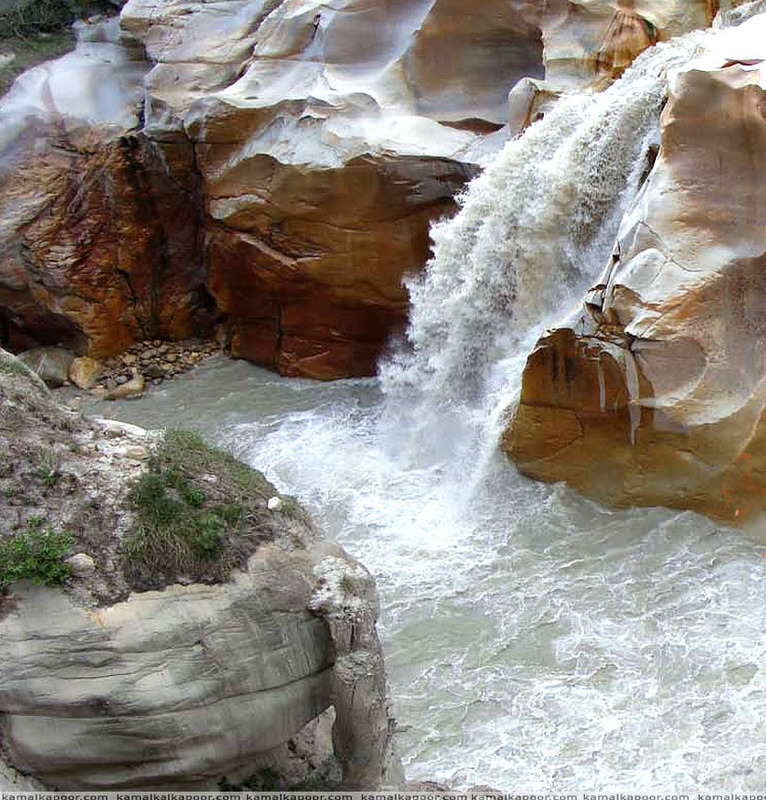 Gam bhuvam gata iti ganga – since she reached this Earth from sky, she is Ganga. As per Hindu tradition, it was King Bhagiratha’s austerities and desire to free the souls of his ancestors that brought Holy River Ganga from heaven to earth. One of the most important reasons why many people want to be cremated on the banks of Holy Ganga and want their ashes to be immersed in Ganga is that they will attain Moksha or liberation from cycle of birth and death. Legends add special value and significance to any place. There was a king in the dynasty of Ikshvaku by name Sagara. He was a great ruler who performed 99 Ashwamedha yagas. If anyone conducts 100 Ashwamedha yagas, he will be elected for Indra's position. Who ever conducting Ashwamedha Yaga, will leave a horse with some note on it. where ever that horse roam in one year, all that land will belong to the one who is conducting the yaga. If anyone stops that horse, they should fight with who ever conducting the yaga. If they loose, they should leave the horse again. If the one conducting yaga got defeated, yaga will be a failure. Sagara was conducting his 100th Ashwamedha yaga during which his sons roamed about the earth leading the horse as a sign of regal supremacy over all kingdoms. Indra not wishing to loose his position took the horse and left it near sage Kapila's hermitage in Pathala (underworld). The king Sagar supposedly had 60,000 sons born of Queen Sumati and one son, Asamanjas, born of Queen Kesani who accompanied the horse. Lord Indra, in the heavens, fearing the loss of his supremacy as the divine king, stole the horse and tied it in the hermitage of the great sage Kapila who was in meditation. The army of the 60,000 sons stormed the hermitage of Kapila and were about to attack him when the sage opened his eyes and reduced all the 60,000 sons of King Sagar (except Asamanjas) to ashes through his yogic powers. It was said that the souls of the 60,000 sons would rest in peace only when they were washed by the Ganga. Ganga, at that time, is believed to have flowed in the heavens and not on earth. Thus it was that successive rulers, Asamanjas, Anshuman and Dilipa made attempts one after another to get the Ganga down to the earth from the heavens. They were unsuccessful and that ‘burden’ now passed on to their successor, Bhagiratha. The place where he did the penance is the great "Haridwar". There is a place called Brahma Kundam (theertham) and from this place he performed severe penance to bring down the Ganga. 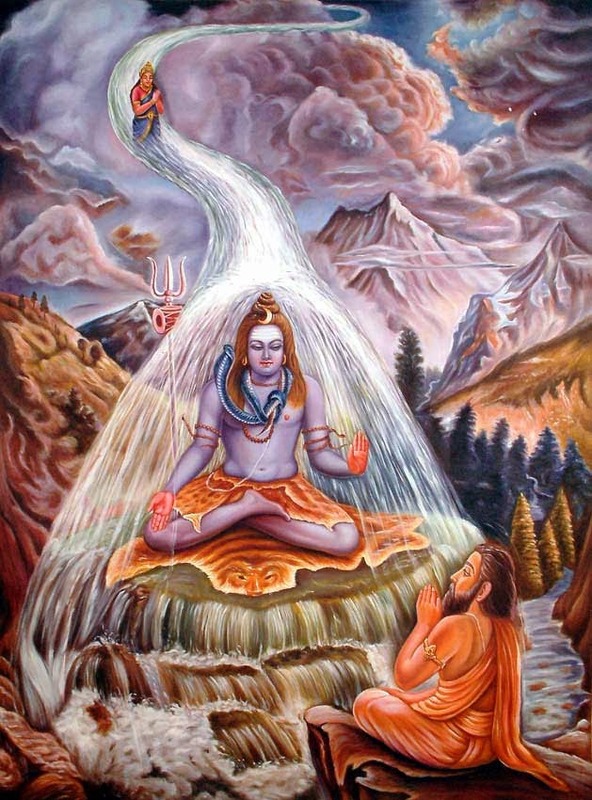 Ganga is also described as flowing in three streams and hence referred to as Tripathaga (one that moves in three paths) or Trisrotas (one that has three streams). At this, Bhagiratha approached Kailasa, the abode of Lord Shiva, and prayed to him for help. Lord Shiva agreed to help. He took the impact of the celestial Ganga on His head and trapped her in His matted locks. It was as a tiny stream that He let her flow out of His matted locks. At that time, Ganga landed at Gangotri (Bindu Saras). The term Gangotri is composed of two words - Ganga and Utari (meaning ‘the place where Ganga descended’). According to Srimad Bhagavata Purana, Ganga originates from the beautiful lotus feet of Lord Sri Hari Himself. The Lord, during His incarnation as the dwarf brahmana Vamana that was taken in order to subdue the ego of His proud devotee King Mahabali, took the gigantic form of Trivikrama, the One who measured all the three worlds and the entire creation in two steps. When this happened, the Lord’s left foot reached up to Satyaloka, the high realm of Brahma. Thrilled to see the Lord’s holy feet, Brahma immediately offered humble worship with water from his kamandalu. This holy water, purified and sanctified by the touch of the Lord’s feet, gushed down as the sacred Ganga. Since she washed the feet of Lord Sri Hari (Vishnu) in Brahmaloka, she is called Vishnupadi. She then descended to Maharloka the residing place of Dhruva, the brilliant star among Lord’s devotees. The river asked Bhageeratha to show her the way to his ancestors. So Bhageeratha sped fast on his horse ahead, asking the river to follow him. A sage by name Jahnu was in meditation along the path of the mighty Ganga. He was infuriated when the river flooded his hermitage and drank the whole river dry. It took years of meditation for Bhageeratha to please the sage. The sage pacified and let the river flow out through his ears not wishing to leave it through mouth which may impure Ganga. Thus Ganga was called Jahnavi. The river finally reached the underground where the ashes of Bhageeratha's ancestors lay scattered. The contact with the holy river purified the sons of Sagara and gave them immediate salvation. This way Bhageeratha faced so many challenges selflessly and finally brought Ganga from heaven to the earth. Telling this story to Lord Rama, Vishwamitra said "Rama your ancestor Bhagirathan got this Ganga down to earth and hence you be happy". Now that we have seen Ganga and how she came down to earth. Next let us see all the places where river Ganga flows.